When Bob and Char Nelson relocated from Provo to the Harvard-Yale area in Salt Lake City, they knew it was only a matter of time before they would remodel their new, old house. Right after they moved in, they finished the basement, but the main floor, upstairs and exterior needed some work, too. Their original home was built in 1927, but had undergone a major renovation and addition in the 1970s. The back of the house had some odd shapes, and the exterior had ben finished with fiberboard paneling that was starting to fall off. The Nelsons sometimes felt like they were living in a stranger’s home. Char loved the house and Bob was getting used to it, but it wasn’t quite “theirs’” just yet. The bathroom remodel freed up some square footage that was reconfigured to expand an adjacent bedroom and add some badly needed storage in the form of two closets. The Nelsons stayed within the footprint of the original house, but came away with much more usable space and beautiful finishes, such as hardwood floors throughout. The fun fixtures and finishes they selected made the home their own. However, beauty and functionality were just two goals of the remodel. The Nelsons obviously wanted their house to be structurally sound but they were also interested in achieving the best level of energy efficiency possible. Bob had long been interested in generating his own electricity with solar panels. Because this house’s backyard faces south, it is the ideal orientation for photovoltaic solar panels. When customers generate their own power, it is used in the home. Therefore, the Nelsons decided to just install enough panels to generate as much energy as they calculated they would use in the accounting period. They ended up installing 15 panels, as well as a solar water heating system. They installed the system in September and through the winter they didn’t generate much energy. But in March and April, they are already generating more than they did last September. Last month, they paid $17 for electricity and natural gas combined. Those savings are offsetting the initial cost of the system. Bob figures that it will take 12 years for the solar panels to pay for themselves in energy savings and five to six years for the solar hot water heater to pay for itself. The Nelsons are definitely moving in the right direction, and they haven’t even had a sunny, summer yet. In addition to the solar panels and solar water heating system, the Nelsons also replaced the windows and all of the attic and exterior wall insulation that was accessible. We recommend adding insulation wherever you can when you are remodeling an older home. With the temperature swing between our Utah seasons, proper insulation is a must-have. 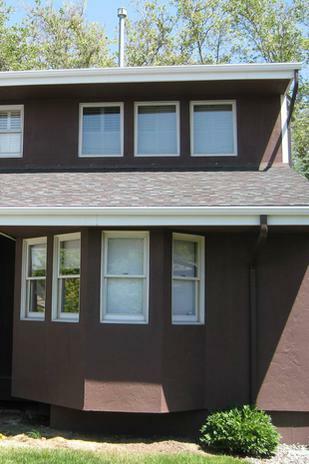 Remodeling is a perfect time to look into adding or upgrading your insulation and updating to energy efficient windows. 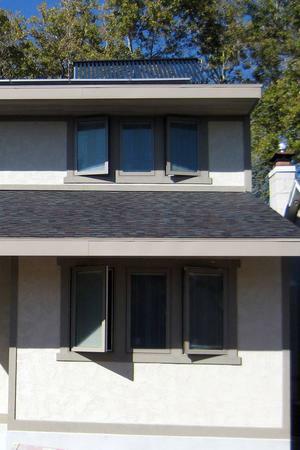 The Nelsons actually chose to install triple-pane windows and open-cell foam insulation, and maintain larger roof overhangs on the south and west sides of the home to minimize heat gain and therefore the amount of energy required to cool the home. That alone helps with your energy bill, even if you are not generating your own electricity. The Nelsons’ project had more interesting aspects that we will have to save for next week. They had a few amazing discoveries in the construction process. We will just say they feel safer now that they remodeled. Watch for details in next week’s column when we revisit the Nelsons in Harvard-Yale.